Never mind Brexit. France looks like quitting the EU. When he met President Macron in April, Trump suggested that France should leave the European Union, offering him commercial conditions more advantageous than those of the EU. We do not know what is being decided in Paris. But it is significant that France launched a plan anticipating joint military operations with a group of EU countries, a plan made independently of the decision-making apparatus of the EU. The agreement was signed in Luxembourg, on 25 June, by France, Germany, Belgium, Denmark, Holland, Spain, Portugal, Estonia and the United Kingdom, which would therefore be able to participate even after its exit from the EU in March 2019. Two summits, both in Brussels at a two-week interval, represent the status quo of the European situation. The meeting of the European Council on 28 June confirmed that the Union, founded on the interests of the economic and financial oligarchies, beginning with those of the greatest powers, is presently crumbling because of its conflicts of interest, which are not limited to the migrant question. The North Atlantic Council – to be attended, on 10-11 July, by the heads of state and government of 22 EU countries (of a total of 28), members of the Alliance (with Great Britain leaving the Union) – will reinforce NATO under US command. President Donald Trump will therefore be holding the strongest cards at the bilateral Summit which is to be held five days later, on 16 July in Helsinki, with Russian President Vladimir Putin. Whatever the US President stipulates at the negotiating table, it will fundamentally affect the situation in Europe. The fact that the USA have never wanted a unified Europe as an equal ally is no secret to anyone. For more than 40 years, during the Cold War, they maintained Europe in subordination as the front line of the nuclear confrontation with the Soviet Union. In 1991, when the Cold War was over, the United States feared that the European allies could question their leadership or decide that NATO was now obsolete, overtaken as it was by the new geopolitical situation. 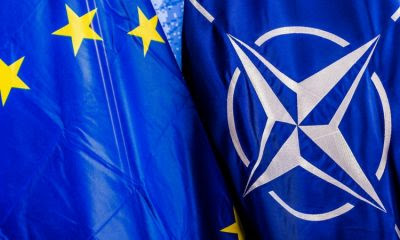 This is the reason for the strategic reorientation of NATO, still under US command, recognised by the Treaty of Maastricht as the “foundation for the defence” of the European Union, and also for its expansion towards the East, linking the former countries of the Warsaw Pact more to Washington than Brussels. During the wars waged after the end of the Cold War (Iraq, Yugoslavia, Afghanistan, Iraq for the second time, Libya, Syria), the United States were pursuing secret deals with the greatest European powers (Great Britain, France, Germany) and sharing with them certain zones of influence, while from the other European states (including Italy) they obtained what they wanted without any substantial concessions. Washington’s main objective is not only to keep the European Union in a subordinate position, but even more so, to prevent the formation of an economic zone which could unite all of Europe, including Russia, by connecting to China with the developing “new Silk Road”. This has led to the new Cold War that was triggered in Europe in 2014 (during the Obama administration), and the economic sanctions and the escalation of NATO’s strategy against Russia. The strategy of “divide and rule”, originally dressed up in the costumes of diplomacy, is now clear for all to see. When he met President Macron in April, Trump suggested that France should leave the European Union, offering him commercial conditions more advantageous than those of the EU. We do not know what is being decided in Paris. But it is significant that France launched a plan anticipating joint military operations with a group of EU countries, a plan made independently of the decision-making apparatus of the EU. The agreement was signed in Luxembourg, on 25 June, by France, Germany, Belgium, Denmark, Holland, Spain, Portugal, Estonia and the United Kingdom, which would therefore be able to participate even after its exit from the EU in March 2019. The French Minister for Defence, Florence Parly, noted that Italy has not yet signed the agreement because of “a question of details, not substance”. In fact, the plan was approved by NATO, since it “completes and augments the rapidity of the armed forces of the Alliance”. 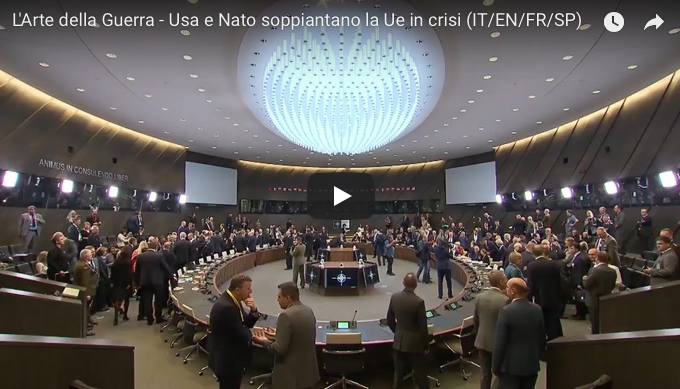 And, as underlined the Italian Minister for Defence Elisabetta Trenta, because the “European Union must become a provider of security at the international level, and to do so, it must reinforce its cooperation with NATO”. This article was originally published in Italian by Il Manifesto. Did France ever join the Euro? As the Euro collapses, bankers ready gold as the solution, and relaunch of national currencies.